Howdy folks! Today was absolutely beautiful. 82 degrees, sunny, and beautiful blue skies, it was almost a pity I had to work today rather than be outside. But then my co-worker’s shared the Dingo Ate My Baby story. Google it. There’s a Seinfeld episode on it too. Seriously though, I love my job. Tonight, we worked out (leg day) and then Andrew and I walked our pup. 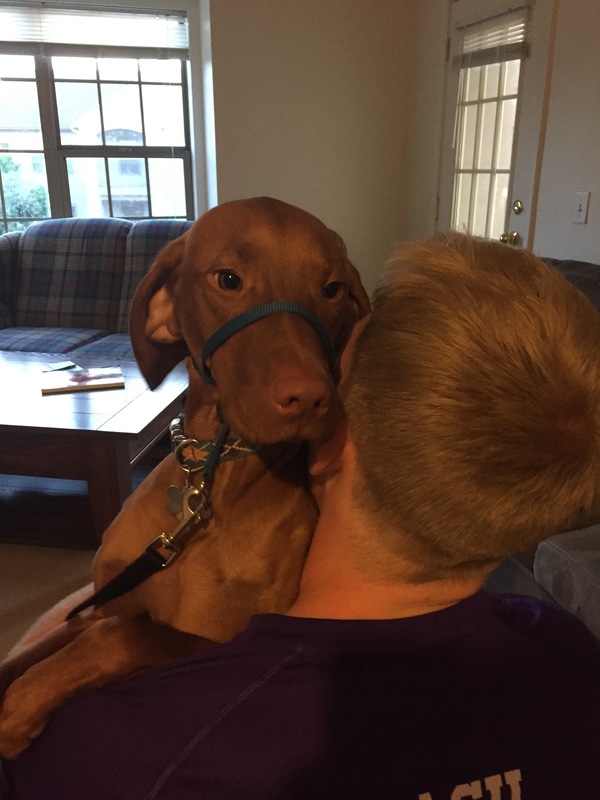 The Gentle Leader is amazing for dogs who pull, but Kingsley hates it! So he tries to snuggle with us in an attempt to convince us he doesn’t need it. Haha. Also, I just completed Whole30 Day 2! Today was easier, and I had food prepped. I’m definitely in the “this is easy phase!” Days 4 and 5 are going to get me. Andrew and I have our engagement party with the family on Saturday, and I’m trying on dresses, so hopefully I will stick to Whole30! I’m thinking I’ll probably order a steak and grilled vegetables or a salad and bring my own dressing. 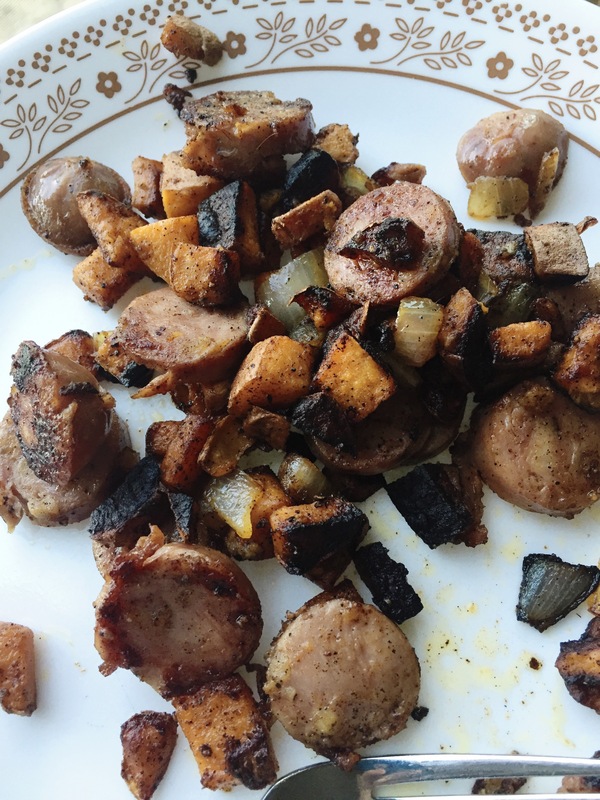 Today’s Whole 30 Meals included two meals of Breakfast Sausage Browns! Dice the sweet potatoes and place in a pan with 2 T of coconut oil, and all the spices. Cover with lid, stirring every few minutes. Meanwhile, dice your onion, and slice your chicken sausage into a thickness of your choice. I did about 1/2 inch slices. Once potatoes begin to crisp (7-10 minutes), add onions, and chicken sausage, stirring frequently. Once onions begin to be translucent, it is done. Enjoy!! Makes about 2 servings. I split them up for breakfast and dinner. Also, on an oil note, my Essential Rewards shipped, and I qualified for all of the promotions. (HINT: There may be a giveaway of Grapefruit oil in the upcoming weeks!) I ordered so much oily goodness, and cannot wait to get them in! As always please comment or shoot me an email at kelsileeEO@gmail.com!